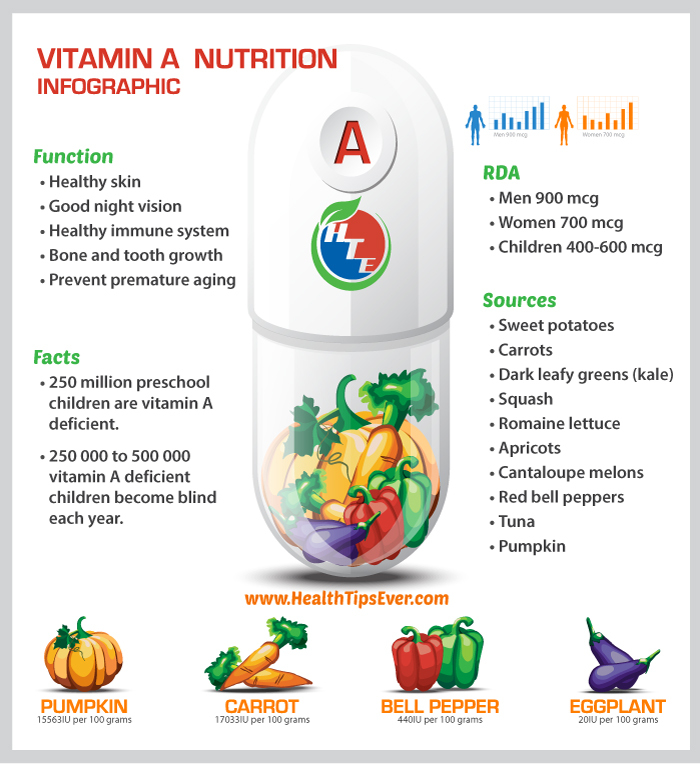 An estimated 250 million preschool children are deficient of vitamin A which is required by the body to keep the skin and the mucous membranes of the digestive, respiratory and urinary tracts healthy. Vitamin A is also needed for good night vision since the body uses it to make pigments inside the eye that enable a person to see well when the light is dim. This vitamin is also required for the growth and specialization of all the cells in the body. As a powerful antioxidant, this nutrient protects cells from the damage caused by free radicals which results in chronic diseases and premature aging. Vitamin A is also needed by theimmune system to help it fight infections caused by bacteria and viruses. Kale and other green leafy vegetables like spinach, mustard greens, collard greens, turnip greens, beet greens and Swiss chard. The dark green leafy vegetables in this list together with the bright red, yellow and orange fruits and vegetables contain a carotenoid known as beta-carotene. This pigment is a pro-vitamin A because it is converted by the body into vitamin A.
Tuna and other oily fish as well as beef, liver, kidney, chicken, turkey, eggs, milk, yogurt, cheese and other animal foods that are rich in this vitamin provide retinolwhich is the active form of vitamin A. Foods that have been fortified with vitamin A are other good sources of this nutrient. Examples include cereals, sugar and milk as well as edible oils and fats like margarine. The recommended dietary allowance (RDA) for vitamin A is 900 micrograms (mcg) per day for men and 700 mcg for women. This is equivalent to 0.9 mg and 0.7 mg respectively. This RDA for vitamin A can be obtained by eating a quarter cup of raw carrots or a whole cup of raw bell peppers. A quarter cup of boiled kale can also provide enough vitamin A for one day. Around 250 000 to 500 000 children who suffer from vitamin A deficiency become blind each year with almost 50% of them dying within 12 months of losing their sight. Early symptoms of keratomalacia, which is the eye condition caused by vitamin A deficiency include dry eyes and night blindness. Persons with vitamin A deficiency are alsomore susceptible to developing bacterial and viral infections since this nutrient helps the mucous membranes repel harmful micro-organisms. Vitamin A deficiency is also associated with infections like measles and pneumonia becoming more severe. Vitamin A is required by the body to maintain healthy skin, eyes and ensure that the immune system functions normally. Foods that are good sources of this vital vitamin should therefore be consumed every day to prevent vitamin A deficiency.